The rapid, simple determination of surfactants in environmental samples is essential because of the extensive use and its potential as contaminants. We describe a simple, rapid chemiluminescence method for the direct determination of the non-ionic surfactant Triton X-100 (polyethylene glycol tert-octylphenyl ether) in environmental water samples. The optimized experimental conditions were selected, and the mechanism of the Luminol-H2O2-Triton X-100 chemiluminesence system was also studied. The novel chemiluminescence method for the determination of non-ionic surfactant Triton X-100 was based on the phenomenon that Triton X-100 greatly enhanced the CL signal of the luminol-H2O2 system. The alkaline medium of luminol and the pH value obviously affected the results. Luminol concentration and hydrogen peroxide concentration also affected the results. The optimal conditions were: Na2CO3 being the medium, pH value 12.5, luminol concentration 1.0 × 10-4 mol L-1, H2O2 concentration 0.4 mol L-1. The possible mechanism was studied and proposed. Under the optimal conditions, the standard curve was drawn up and quotas were evaluated. The linear range was 2 × 10-4 g·mL-1-4 × 10-2 g·mL-1 (w/v), and the detection limit was 3.97 × 10-5 g·mL-1 Triton X-100 (w/v). The relative standard deviation was less than 4.73% for 2 × 10-2 g·mL-1 (w/v) Triton X-100 (n = 7). This method has been applied to the determination of Triton X-100 in environmental water samples. The desirable recovery ratio was between 96%–102% and the relative standard deviation was 2.5%–3.3%. The luminescence mechanism was also discussed in detail based on the fluorescence spectrum and the kinetic curve, and demonstrated that Triton X-100-luminol-H2O2 was a rapid reaction. Surfactants are employed in a vast number of uses including domestic and industrial detergents, solubilization of membranes, and pharmaceutical and cosmetic formulations. Until recently, surfactants have drawn much research interest as enhancers in some special reactions [1, 2]. With these extensive uses (more than 15 million tonnes/year), their toxicity and negative effect on the self-purification capability of surface water, make these synthetic organic compounds one of the main environmental concerns. Therefore, a number of sensitive and high resolution techniques have been developed for the determination of low concentrations of cationic surfactants and anionic surfactants in different matrices, including gas and liquid chromatography [3–7], spectrophotometry [8–11], electrochemical methods [12, 13], capillary electrophoresis [14, 15] and sensors[16, 17]. Chromatographic techniques are the major methods in the analysis of surfactants due to the high efficiency and high sensitivity. However, the most important drawback for practical applications is their complication, and chromatographic techniques do not lend themselves to rapid analysis or to on-site studies. Moreover, there are few assays for the determination of non-ionic surfactants. In recent years, extremely sensitive analytical techniques based on chemiluminescence (CL) and bioluminescence systems have received considerable attention. Simplicity of detection, low detection limits, large calibration ranges and short analysis times are some of the characteristics that make the methods attractive. Additionally, there are a few reports about using CL methods to analyze surfactants in environmental samples [18, 19]. TritonX-100 is a water-soluble, liquid, non-ionic surfactant that is recognized as the performance standard among similar products. It is an octylphenol ethoxylate with an average of nine to ten moles of ethylene oxide and is a 100-percent active product. It is widely used as a substrate for detergents and in textile and fiber manufacture because of its excellent detergency, excellent wetting ability and excellent grease and oil removal from hard surfaces. In addition, it is also used as an enhancer in some reactions [21–23]. However, the detection methods for Triton X-100 are limited [24, 25]. To our knowledge, up to now, CL determination of Triton X-100 has not been reported. The aim of our study is to develop a simple, rapid and sensitive CL method for the determination of non-ionic surfactant Triton X-100. This method is based on the fact that Triton X-100 could enhance the CL emission arising from the reaction of luminol with hydrogen peroxide. It has been successfully used to determine Triton X-100 in environmental water samples. Moreover, the mechanism of the Luminol-H2O2-Triton X-100 chemiluminesence system was studied in detail. It is well known that the luminol-hydrogen peroxide CL system requires an alkaline medium. Our preliminary experiments showed that the CL signals produced from the reaction of Triton X-100, luminol and H2O2 changed greatly with the different alkaline medium in an ultra-weak luminescence analyzer. So the effect of different alkaline mediums with the same pH value at 11 (NH3·H2O, NaOH, NaHCO3, Na2CO3:NaHCO3 = 1:3, Na2CO3:NaHCO3 = 2:3, Na2CO3:NaHCO3 = 1:1, Na2CO3:NaHCO3 = 3:2, Na2CO3:NaHCO3 = 3:1) on the CL intensity was investigated. The concentration of NaHCO3 and Na2CO3 was 0.2 mol·L-1. NaOH concentration was 0.001 mol·L-1 and NH3·H2O concentration was 0.1 mol·L-1. The results (Fig. 1) showed that when the proportion of Na2CO3 and NaHCO3 was 3:1, the maximum CL signal was obtained. Nevertheless, the blank signal of the system was too strong. So 0.2 mol·L-1 Na2CO3 was chosen because the CL signal was much stronger than other mediums and the best signal-to-noise ratio was obtained. Effect of different medium of luminol on the CL intensity. The effects of pH (11–13.5) were also investigated. The results (Fig. 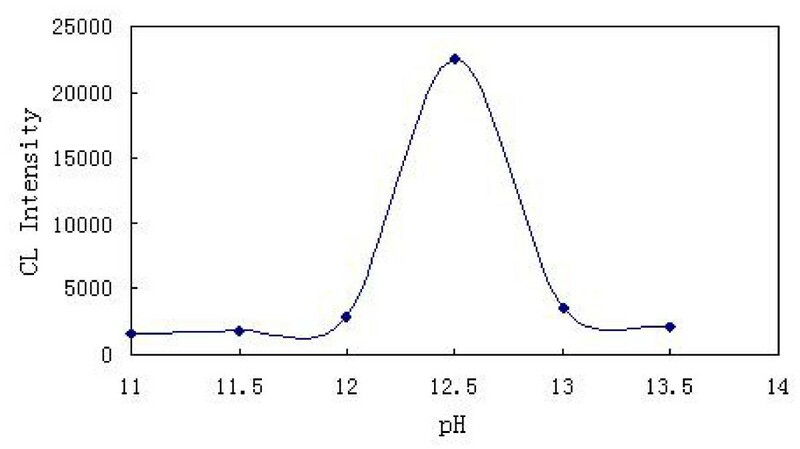 2) showed that ΔI reached the maximum value when the pH was 12.5, above which the CL intensity decreased. For obtaining better signal-to-noise ratios, pH 12.5 of luminal solution was selected as optimum. 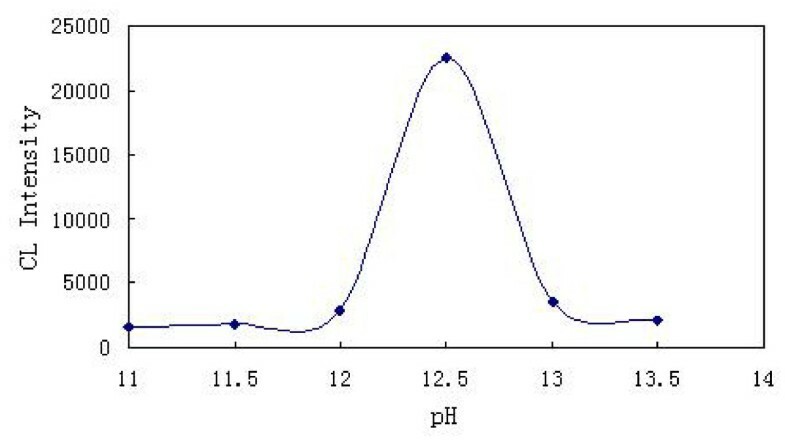 Effect of pH on the CL intensity. As the chemiluminescence reagent, luminol concentration affected the CL intensity. The experimental results showed that the CL intensity increased from 1.0 × 10-5 mol·L-1 to 2.0 × 10-3 mol·L-1 and reached the maximum value at the luminol concentration of 1.0 × 10-4 mol·L-1. So 1.0 × 10-4 mol·L-1was chosen as the optimal luminol concentration for subsequent experiments. The effect of H2O2 concentration (0.05 mol·L-1-0.5 mol·L-1) on the CL intensity was examined. The best signal-to-noise ratio was achieved when the concentration of H2O2 was 0.4 mol·L-1. So 0.4 mol·L-1 was chosen as the optimal H2O2 concentration. Under the optimum experimental conditions, CL response to Triton X-100 concentration was linear in the range of 2 × 10-4 g·mL-1-4 × 10-2 g·mL-1 (w/v). The detection limit was 3.97 × 10-5 g·mL-1 (w/v), calculated from the International Union of Pure and Applied Chemistry (IUPAC) recommendations (3σ). The regression equation was ΔI = 474303C-35.775 with a correlation coefficient of 0.9996. The relative standard deviations (RSD) for 7 injections with 2 × 10-2 g·mL-1 (w/v) Triton X-100 was 4.73%. Several research works have confirmed that some metal ions (Fe2+, Co2+ and Cu2+) could catalyze and enhance the CL signals greatly in a luminol-H2O2 CL system [26, 27]. Therefore, it is necessary to examine the interference of some coexisting foreign inorganic ions and organic compounds on the luminol-H2O2-Triton X-100 system in order to evaluate the selectivity of the new method. The interference studies were conducted by analyzing a standard solution of 1.0 × 10-2 g·mL-1 TritonX-100 to which increasing amounts of foreign ions are added. The tolerated limit of each foreign species was taken as a relative error of ± 5%. The tolerable ratio for foreign species was 1-fold for PO43-, 0.1-fold for Na+, Cl-, 0.1-fold for K+, 1 × 10-4-fold for Pb2+, Cu2+, 1 × 10-9-fold for Ni2+, 1 × 10-10-fold for Co2+, 0.5-fold for glucose, starch, respectively. Moreover, three kinds of other surfactant CTMAB, SDBS and Tween-80, which may co-exist with the Triton X-100 in the water sample were investigated. The tolerable ratio was 5-fold for CTMAB and Tween-80, 2-fold for SDBS. It can be seen that severe interference was caused by Co2+ and Ni2+. Thus, 1.0 × 10-3 mol·L-1 of EDTA was added to the luminol solution to restrain the interference from metal ions. With the addition of EDTA, the tolerable ratio improved to 1 × 10-3-fold for Ni2+, 1 × 10-4-fold for Co2+. It demonstrated that EDTA had an obvious restraining effect on metal ions. The application of the proposed method was performed by testing environmental water and the recovery of known amounts of standard solution of Triton X-100 added to the different samples. The results obtained are shown in Table 1. As can be seen, the recoveries of added Triton X-100 were quantitative and the reproducibility was satisfactory. The kinetic curve of the CL reaction in the presence and absence of Triton X-100 was investigated with a static method, using the procedure shown in the experimental section. The results (Fig. 3) showed that it was a fast-type luminescence and the CL intensity reached a maximum within 2 s after the addition of Triton X-100. Comparing curve a (in the presence of Triton X-100) to curve b (in the absence of Triton X-100), we could draw a conclusion that Triton X-100 could enhance the CL reaction in the luminol-H2O2 system because the CL signal of curve a (Triton X-100-luminol-H2O2) was much stronger than the CL signal of curve b. 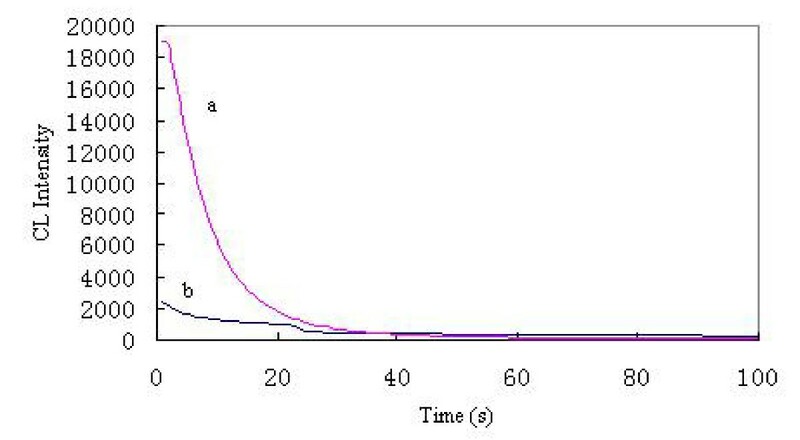 The kinetic curve indicated the CL method was rapid and suitable to perform a determination of Triton X-100. The kinetic curve of the Triton X-100-luminol-H 2 O 2 CL system and luminol-H 2 O 2 CL system. Several research works were focused on the CL reaction mechanism of luminol. The research results have confirmed that the 3-aminophthalate anion is the emitter in the luminol CL system no matter which medium and oxidant were being used [28, 29]. The CL emission of this reaction was generated from the 3-aminophthalate anion rebounding to the ground state from the excited state. The maximum emission was 425 nm. 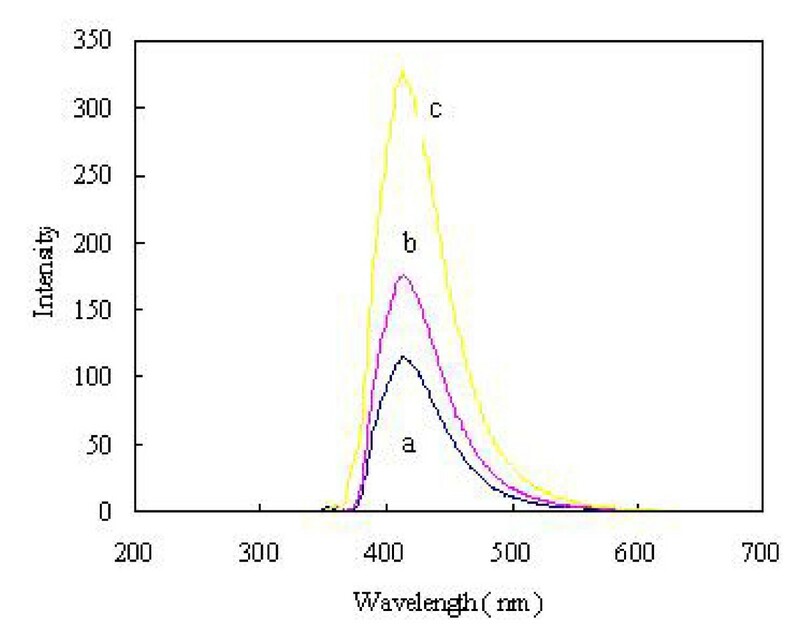 In order to confirm which was the emitter in the Triton X-100-luminol-H2O2 system, the fluorescence spectrum (Fig. 4) was measured by spectrophotometer. From Fig. 4, the results indicated that the maximum emission of three systems (luminol, luminol-H2O2 and Triton X-100-luminol-H2O2) were also near 425 nm and the Triton X-100-luminol-H2O2 system provided the strongest signal. It means that the emitter of the Triton X-100-luminol-H2O2 system is also the 3-aminophthalate anion and Triton X-100 could enhance the CL intensity of the lumino-H2O2 system. Thus, it was supposed that the function of Triton X-100 was that it could be found in micelles, and the luminol molecule permeated into the micelle so that it could be concentrated in the micelle, and then the quantum yield of the CL reaction was improved and the CL intensity was improved. Critical micelle concentration (CMC) of Triton X-100 is 0.2 × 10-3 mol·L-1 at 25°C. In this study, the concentration range of Triton X-100 was between 2 × 10-4 g·mL-1 and 4 × 10-2 g·mL-1 (w/v), converting to 0.3 × 10-3 mol·L-1-60 × 10-3 mol·L-1. It showed that the Triton X-100 concentration was above CMC and supported the viewpoint that the function of Triton X-100 was that it could be found in micelles. In order to confirm the improving effect of the luminol in the Triton X-100 micelle microenvironment, further experimental data was provided in Table 2. From Table 2, it can be seen that Triton X-100 provided obvious enhancing effects on the luminol-H2O2 system. The higher the Triton X-100 concentration, the more obvious the enhancing effect of Triton X-100. Fluorescence Spectrum of three systems. a. luminol solution b.luminol-H2O2 c. luminol-H2O2-Triton X-100. Based on the discussions above and combining this with the kinetic curve, the possible mechanism of the present reaction was proposed as follows: (1) Luminol was oxidized by hydrogen peroxide to produce excited state 3-aminophthalate anion; (2) There were micelles with the addition of Triton X-100, and the reaction environment was improved, luminol molecules permeated into and concentrated in micelles, the reaction was sensitized and the quantum yield of the CL reaction was improved and the CL intensity was enhanced; (3) The excited state 3-aminophthalate anion rebounded to the ground state, producing emission [28, 29]. From the above results, it was concluded that this method provides a simple technique for quantitative analysis of Triton X-100. The CL intensity was linear with Triton X-100 concentration in the range of 2 × 10-4 g·mL-1-4 × 10-2 g·mL-1 (w/v). The detection limit was 3.97 × 10-5 g·mL-1 (w/v). The desirable recovery ratio ensured the accurate detection of Triton X-100 in environmental water samples. The mechanism was also investigated in detail by fluorescence spectrum and kinetic curve analysis. All chemicals were of analytical reagent grade and doubled distilled water was used throughout. Luminol and Triton X-100 were purchased from Sigma Corporation. The 0.01 mol·L-1 luminol stock solution was prepared by dissolving 0.1772 g luminol with 5 mL 1 mol·L-1 NaOH solution and doubled distilled water to 100 mL. The luminol solution was stable for at least 1 week when stored in the refrigerator at 4°C. 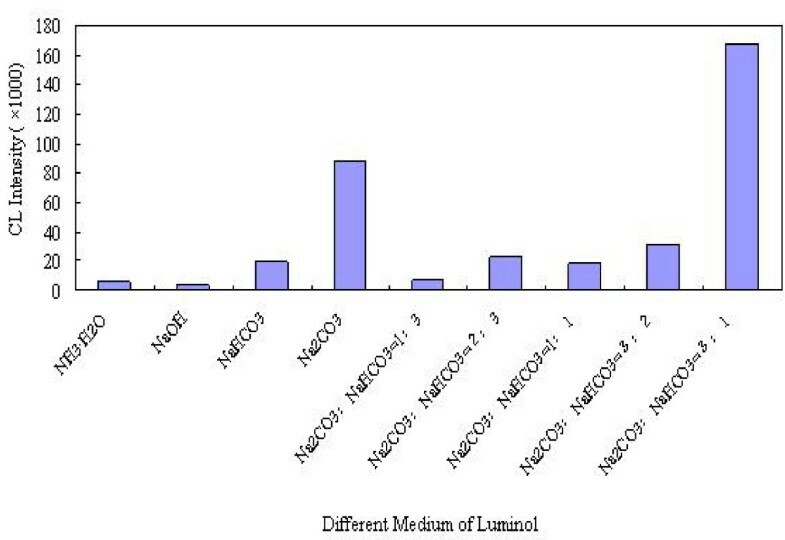 Working standard solutions of luminol were freshly prepared from the stock solution by appropriate dilutions with 0.2 mol·L-1 Na2CO3 before use and pH adjusted to 12.5 with 1 mol·L-1 NaOH. A standard solution of Triton X-100 (8% w/v) was prepared by dissolving 8 g Triton X-100 with doubly distilled water to 100 mL. Working standard solutions of Triton X-100 were freshly prepared from the stock solution by appropriate dilutions. The CL signal was measured with a static method by a BPCL ultra-weak luminescence analyzer (Institute of Biophysics, Chinese Academy of Science, Beijing, China). The CL intensity, amplified by a sensitive photomultiplier tube (PMT) operated at -400 V, was measured under the control of a computer. Fluorescence spectra were obtained with a RF-5301PC fluorescence spectrophotometer (Shimadzu, Japan). The regent solutions were injected rapidly into the sample pool (each solution was 100 μL) and in turn the reaction door closed instantly so that the reaction was in the dark. At the same time, the computer program was started immediately to record the CL signal. The CL intensity ΔI was calculated by ΔI = Is-I0, where Is and I0 are the CL signals in the presence and absence of Triton X-100, respectively. All analysis was performed according to this procedure. 100 μL Triton X-100 (1 × 10-2 g·mL-1), 100 μL H2O2 (0.4 mol·L-1) and 100 μL luminol (1.0 × 10-4 mol·L-1) were injected into the sample pool in the correct order. According to the analytical procedure, the CL signal was collected and recorded consecutively within 100 seconds. And then the curve of CL intensity-time (kinetic curve) was drawn up. Water samples were picked from Nanhu Lake and Tangxun Lake near our campus and also near the countryside. Prior to analysis, the collected water was filtered using a standard 0.45 μm cellulose filter. In order to perform the recovery test, a known amount of Triton X-100 standard solution was added to the samples and then the mixture was diluted to suitable concentration with doubled distilled water for analysis. This study was supported by the Tackle Key Project Foundation of Hubei Province of China (Grant No.2006AA201C40). All authors contributed to the experimental design. Xiaoyu Liu focused on the experiment design and contributed to drafting the manuscript. Aifang Li and Baohui Zhou carried out nearly all of the laboratory work. Chaokun Qiu, Hongmin Ren deal with the data analysis. All authors read and approved the final manuscript.